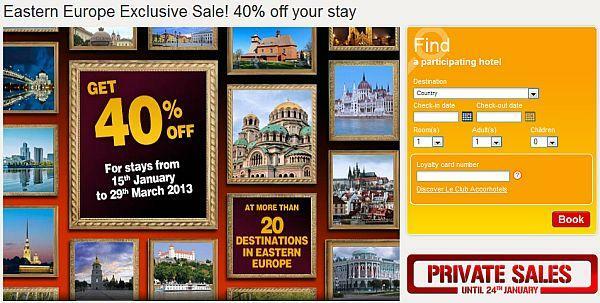 The 40% discount is only valid in participating hotels. Offer valid subject to availability in participating hotels. Promotion cannot be combined with other offer(s). Offer valid from 15-24 Jan 2013 for stays from 8 Feb – 10 Jun 2013, booked at accorhotels.com only. The 40% discount is based on the lowest unrestricted rate. The total cost of the stay is debited upon booking. The booking cannot be changed, cancelled or modified. This special discount (40%) is only valid at participating hotels across Australia. 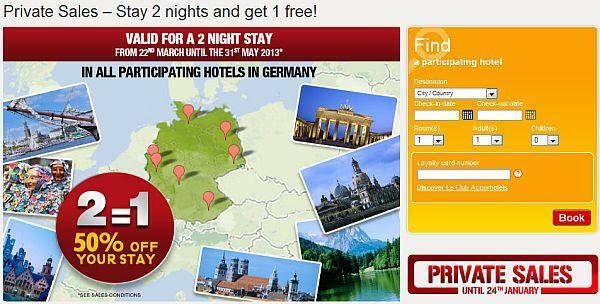 This offer can be booked from 15th – 24th January 2013 on accorhotels.com, for stays from 24th March 2013 to 30th June 2013. The special discounts are based on the Best Unrestricted Rate. The payment of the stay is entirely deducted upon booking. No cancellations or changes are possible. Offer is subject to availability at participating hotels and is subject to a minimum length of stay (at select hotels only). This promotion cannot be combined with any other offer(s). Le Club Accorhotels members can accumulate points with this booking and Accor Advantage Plus members receive their 10% discount. 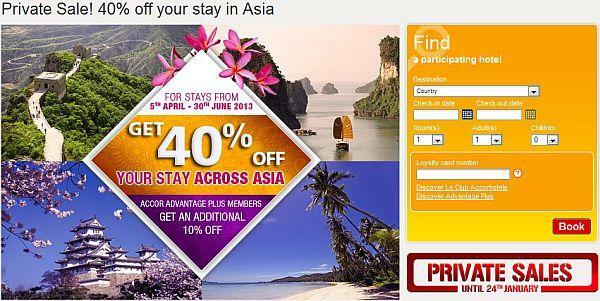 Offer valid from 15 to 24 January for stays from 05 April to 30 June 2013, booked at accorhotels.com only. The 40% discount is based on the lowest unrestricted rate. Accor Advantage Plus members enjoy an additional 10% off discount, which is 50% off the best unrestricted rate. 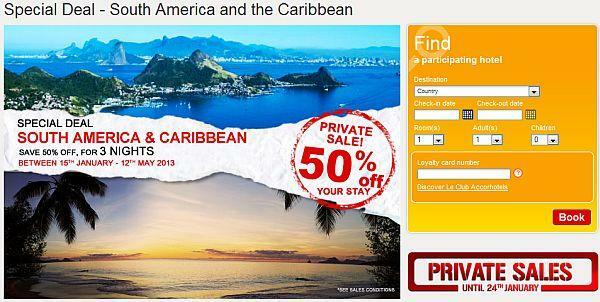 The 50% discount is only valid in participating hotels. Offer valid from 15th January to 24th January for stays from 1st February to 17th March, booked at accorhotels.com only. The 50% discount is based on the lowest unrestricted rate. The 50% discount applies for bookings of 2 consecutive nights in one of the participating hotels of Pullman, MGallery, Novotel, Suite Novotel, Mercure and Adagio. The offer is bookable on all days. This offer can not be combined with any other promotion or offer prices. Le Club Accor Hotels members can earn points with this offer. Offer valid for all bookings made between 15th January – 24th January, 2013 at www.accorhotels.com for all stays of at least 2 consecutive nights between 2nd February – 7th April, 2013. 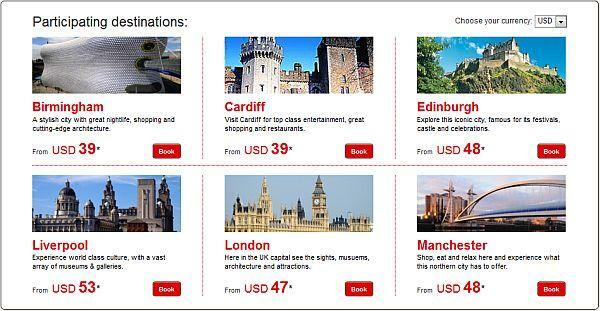 The discount is applied to the lowest rate, with no conditions for booking. Offer valid in participating MGallery, Novotel, Suite Novotel, Mercure, Adagio and ibis Styles hotels in Switzerland and Austria, subject to availability. The special discounts (from 40% to 50%) are only valid in participating hotels. 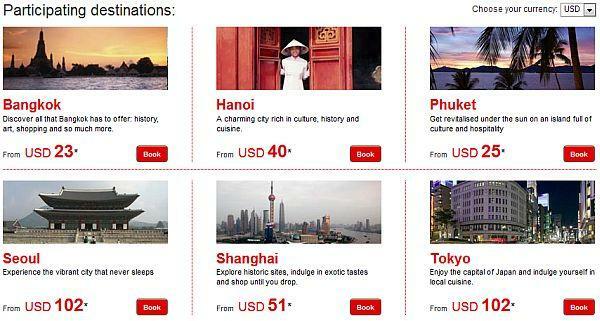 Offer valid from 15-24 Jan 2013 for stays from 1 Feb – 7 April 2013, booked at accorhotels.com only. The discount is based on the lowest unrestricted rate. The special discounts (40% off) are only valid in participating hotels. 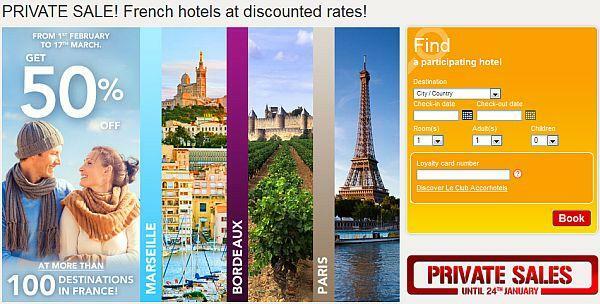 This offer can be booked from 15th January to 24th January on accorhotels.com, for stays between 15th January to 29th March 2013. The special discounts are based on the best unrestricted Rate. Prices shown were correct at the time of online publication. The rates shown are subject to change. 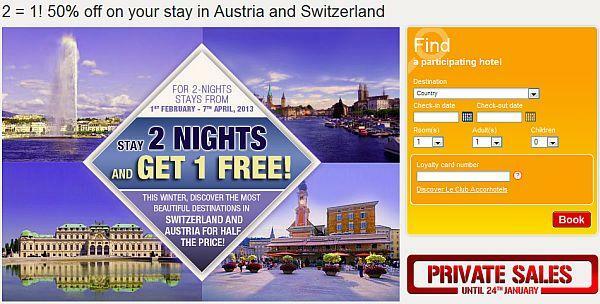 Offer valid from 15th to 24th January 2013 for stays from 16th January to 7th April 2013, booked at accorhotels.com only. The 50% discount is based on the lowest unrestricted rate. The special discounts (from 30% to50%) are only valid in participating hotels. 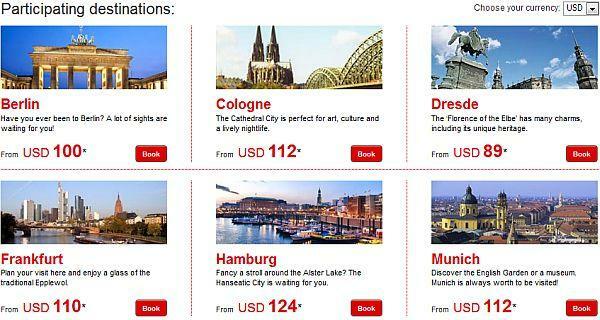 This offer can be booked from 15 – 24 January 2013 on accorhotels.com. For staying dates, see below each country’s sales conditions. The special discounts are based on the Best unrestricted Rate. Portugal, Greece, Morocco: 15th January to 30th April 2013. Minimum stay duration for Portugal is 2 nights. 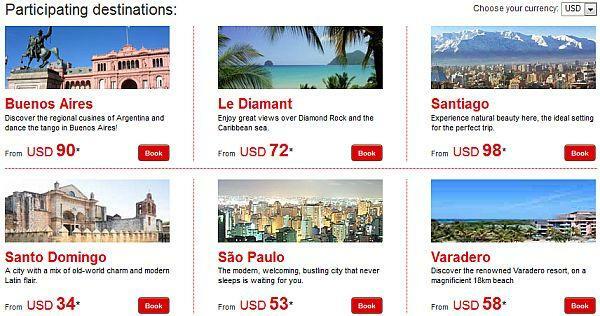 Offer valid from 15 to 24 of January for stays from 3 nights between 15th February – 12th May for Caribbean, and between 15th January to 3rd March for Brazil and South America, booked at accorhotels.com only. The 50% discount is based on the lowest unrestricted rate. Offer valid from 15th – 24th January 2013 for stays from 17th February – 26th April 2013, booked at accorhotels.com only for a minimum stay of 2 nights. The 40% discount is based on the lowest unrestricted rate. If you can plan your trips well in advance, you can save a lot by taking advantage of these Accor’s sales. Unfortunately, I cannot plan my trips more than a month in advance and have never been able to take advantage of these.